Bangin’ the Gears: Welcome to Heartbreak. At some point nearly every gearhead is faced with the task of selling their hot rod, whether it be a beloved modern muscle car or a timeless classic. Some sell because they want to; maybe because they’re upgrading to a bigger and better project or maybe it’s just time to move on, while others part ways because they’ve lost interest, need funds for more important projects or simply need to free up cash to make ends meet. Regardless of the reason, for most of us it’s an emotional chore that doesn’t come lightly. Sure, in one sense it’s freeing to unhinge yourself from a project and free up some cash, but on the other hand, most hot rods are far more than just a physical piece of machinery, they’re a collection of memories, both good and bad. Every project is both as frustrating (at times) as it is enjoyable, perhaps that’s just the nature of the beast. I like to think the old adage explains it best: “Sunny days wouldn’t be special if it wasn’t for rain.” Then again, maybe that’s how I find solace in road-side repairs or broken bits at the race track that kills a weekend of racing! But I digress. Unfortunately and fortunately the time has come for me to sell my daily driver, a 2003 Chevrolet Silverado regular cab step-side truck, which in stock form isn’t much of a hot rod, but thanks to genuine Halibrand billet 6-Beans with knockoffs wrapped with Toyo rubber, traditional pinstriping from Eastbay Speed and Custom, Hotchkis suspension, a Magnaflow exhaust and a Magnacharger MP112 polished supercharger under the hood, it’s been the best 13-second daily driver I could ask for. It hauls hobby-related parts with ease, tows my Fox-body Mustang on an open-trailer and if I take a highway trip without introducing boost, it’ll get 23 mpg. Alas, budget constraints and the thought of starting a family had me considering what was once unthinkable: selling it. 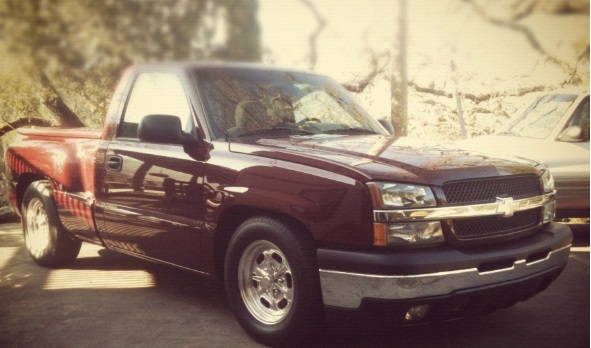 The mere thought of selling my beloved truck sent me into a tailspin. I’d never sold a vehicle that I cared much for and it was difficult to say the least. I asked many old-timers for their input on the matter and every one of them shared similar stories, some were still regretful that they sold their “baby,” while others admitted it was the best decision for the time. A few eventually built a similar project years later, while others venture little further than fondly reminiscing. At the moment I don’t know what category I’ll fall into in years to come, all I know is that the decision to sell my truck didn’t come easily. In fact, it took me down memory lane from the day I got it, the many summer evenings spent cruising, the few unsuspecting BMW, Audi and Mustangs I showed my taillights to and all together all the great memories I’ve had behind the wheel and under the hood. Like most gearheads, at some point our vehicles become more than just a piece of machinery, but rather a chariot back to the many good times we’ve spent with that vehicle, no matter the make, model or year. If there was a silver lining, it would be that the new owner is a good friend’s father, which means I’ll at least get to see the ol’ girl from time to time. But for now, I bid her a fond farewell; It’s been a good run. Do you have a story about the one that got away, the vehicle you forever regret selling? If so, share your story. Until next month, keep the shiny side up. I sold my 1973 Mach1 that I had owned for 16 years. I hated to see it go. As it turned out the buyer added it his collection which is like his own personal museum. It’s still in his museum after 18 years. I sold the first NEW car I had, a 1993 LX 5.0 back in 1998.